Fake Voice is a voice changer software that changes your voice to male, female, old, young, hard, shrill, or some one new. 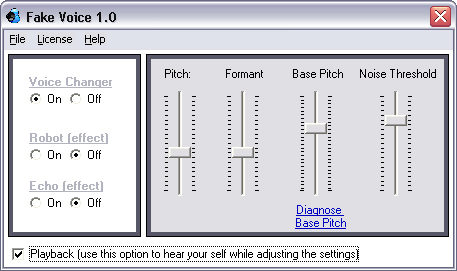 If you are female and want to sound like male or if you are male and want to sound like male, this is your tool. You can apply robotic effect to sound like alien or echo effect to sound like you speaking from a well or tunnel.